The Nissan X-TRAIL is the world’s best-selling SUV in 2017, according to automotive market data research expert JATO. The X-TRAIL, known as Rogue in some overseas markets, enjoyed 814,496 sales, up 6.5 percent year-on-year. It was the fourth most popular vehicle globally in 2017. 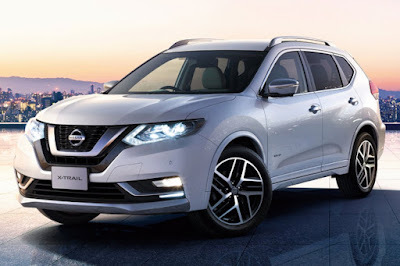 In the Philippines, the X-TRAIL has become the beacon of Nissan Intelligent Mobility (NIM) which redefines the way cars are powered, driven, and integrated into their users’ daily lives. It envisions a future of zero emissions and zero fatalities. Intelligent power is provided by a choice between two gasoline engines in 2.0- and 2.5-liter displacements. The range-topping 2.5-liter generates 171 horsepower and 233 Nm of torque mated to an Xtronic CVT transmission. With Intelligent 4x4, it offers surefooted control in various terrain and road condition. This top-of-the-line X-TRAIL is also fitted with NIM technologies for enhanced safety such as Intelligent Forward Collision Warning and Intelligent Emergency Braking, Around View Monitor with Motion Object Detection, and Blind Spot Warning. The 2018 Nissan X-TRAIL starts at P 1,534,000 and can be experienced at the Nissan Mobility Tour. Discounts ranging from P 5,000 to P 100,000 greet would-be test drivers. The final leg of the tour is slated on March 23-25, 2018 at SM Davao. E di wow! Walang basagan ng trip! They combined the sales of the Xtrail and the Qaqshai which are differently sized vehicles and now pass of the claim that its the best selling SUV. But still 1.8m for 2 measly airbags? Come on Nissan. I've never seen one on the road here. But based from pricing, specs, features and the interior quality, it lags behind the main competitors such as the Mazda CX-5 and Honda CRV. Though, it is on par with the Tucson except on pricing. But ofcourse mazda idiots will put cx5 here. Title says its World's best selling. It doesnt say Philippines does it? ^I just plainly stated the main competitors of the X-Trail. It seems that you are so bitter or anxious of the CX-5. I also included its other competitors aside from the CX-5 so what are you fighting for? Locally, the X-Trail is not competitive enough. LMAO! Ni hindi nga kasama sa top 10 selling SUVs ang pinagmamalaki mong CX5. Top 3 selling SUV ay RAV, CRV at Tucson. Alam na ng lahat hassle ng istop. Idiot, Mazda has never been a big seller, they are a small company but if you look here in the Philippines, Australia and several other countries, they are among the best selling compact SUV. And the car itself is way above most of the competitors. I've never experience the so called hassle of the istop and I'm a Mazda owner. Most of the complaints about the istop comes from people who don't even own a Mazda, lol. Stick with your mediocre car, if you even have a car in the 1st place. Sales does not mean it's the best .. This is how non-luxury car manufacturers generally disrespect us Filipinos, average at best local vehicle line up. Good thing some of them are really improving: Subaru, Honda, Mazda and a little bit of Toyota and Mitsubishi while others are still meh. Nissan will continue to lag behind in terms of sales, meager improvement at best. It's like they didn't learn their lesson. Forgot to mention Ford, they have a good vehicle line up. Except for the after sales service though. Is it Fake news? Or fanatics of other brand can't accept the fact that Nissan xtrail/rogue is the best selling SUV in the world.